After many years of dedicated fundraising activities and events, the students in St Anthony’s Special School, Castlebar, have at last taken delivery of their new specially adapted wheelchair accessible school bus. The bus will be used to transport all students including those in wheelchairs to and from the many varied activities they are involved in during the school day, such as visiting the local Museum in Turlough for workshops, going swimming in Breaffy Leisure Centre, going bowling in Mayo Leisure Centre, visiting local areas of interest as part of educational studies including local towns, factories, recycling centres; amenities such as the Greenway and Lough Lannagh and also allowing students to participate in inter-schools sports events such as attending GAA workshops in Elverys Stadium, basketball and football competitions in Sligo, Galway and Ballina and other sports events around the province. 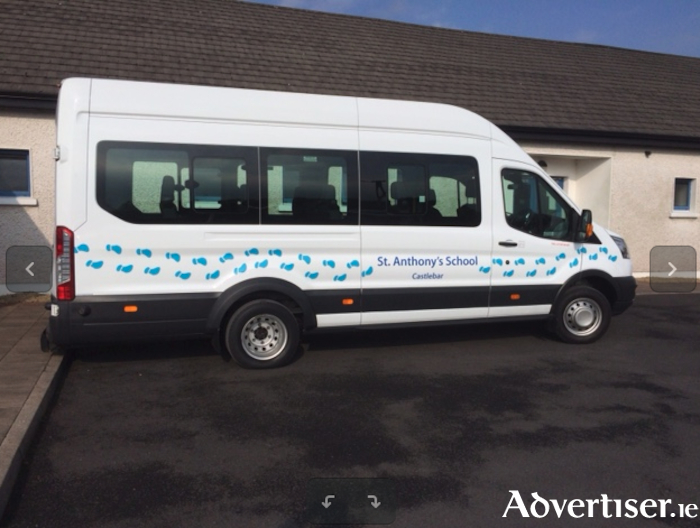 St Anthony’s School are extremely grateful to Michael Moran of Moran’s Coaches, Castlebar, who organised the acquisition, fit out and delivery of the new school bus for the school. The school would also like to sincerely thank everyone who was involved with fundraising and donations over the past six years, including the Friends of St Anthony’s Fundraising Committee, Mary Murray for the annual Trolley Dash; Castlebar Rotary Club; IFAC Accountants Balla; Castlebar Golf Club Phyxers; Westport Lions Club; Baxter Castlebar; EPS Ballyhaunis; Top Oil Castlebar; Tesco Community Fund; Western Care Candlelight Ball Committee; No Name Club Castlebar; Eanya Egan Solicitors, Castlebar; Castlebar Soroptimists; Castlebar Bridge Club; First Choice Credit Union Castlebar; Castlebar Lions Club; Ollie Roache Memorial Poker Classic; the McTigue Sisters Mini-Marathon; Caroline Cresham and Friends concert; Teresa Lydon; Andrew Carney; Denis Coughlan; Monaghan & Sons; MVS Construction and PPG Construction. Page generated in 0.1419 seconds.